Memorable experiences - from wild parties to celebratory dinners - begin the moment you pop open that bottle. DeVine Accessories understands this and introduces the Premium Waiter's Corkscrew, the simplest and sleekest corkscrew that will quickly become the go-to tool for every wine lover. Sleek design and impeccable performance, this handheld corkscrew is every waiter and bartender's best friend. Compact and light to easily fit in anyone's pocket for the easy access and with just one simple motion the corkscrew is ready for use. The double-hinged mechanism allows for any cork to be popped in a two-step process for quickness and efficiency. The slick metallic finish on the handle makes it super comfortable to hold in your hand and paired with the cool grid design on the lever, you will look like a true wine expert. Impress all your friend's at dinner - whip it out and amaze everyone at how easy it is to pop open any wine bottle. If you've used any generic corkscrew, you know that it's not as easy as it looks - but with the Premium Waiter's Corkscrew, it is! The grooved-worm paired with the DuPont coating on the already durable chrome worm makes it so it strongly secures itself within the cork to avoid breakage of the cork. If you want to open a bottle like a true professional, then DeVine Accessories should be your number one stop. COMFORTABLE & EFFORTLESS: The quality materials and ergonomic design combine to make this wine key the easiest and simplest tool to open a bottle of wine. NEVER SLIP DESIGN: The double hinged, two step mechanism along with the extra groove on the lever ensures a secure grip that doesn't slip as you lift the cork. BONUS FEATURES: The perfect tool for bartenders and sommeliers, the corkscrew has a built-in serrated blade to cut foil and a beer bottle opener on the handle. 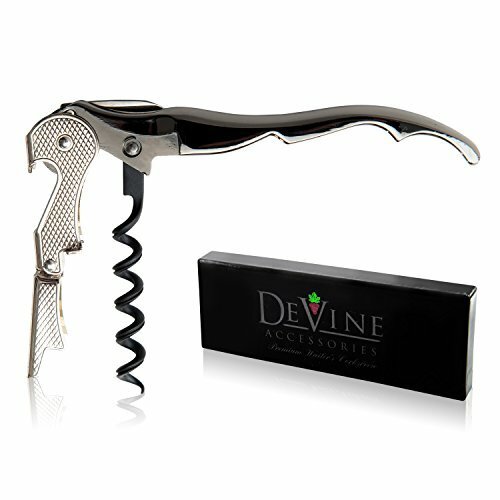 STRONGER & EASIER: Unlike other corkscrews that are chrome plated, DeVine's worm is 100% chrome so it is thinner, stronger and will not break or crack the cork. SLEEK & STYLISH: The compact handheld corkscrew has a metallic finish with an elegant a grid pattern that is modern and sophisticated. Packaged in a gift box. If you have any questions about this product by DeVine Accessories, contact us by completing and submitting the form below. If you are looking for a specif part number, please include it with your message. 10 Pack Corkscrew Wine Opener By HQY - Best Bottle Opener For Beer Or Wine - Love It Or Return It! Thick Stainless Steel, Opens Easy! Premium All-In-One Waiters Corkscrew.